Blog Etiquette & "Liturgy Wars"
We cannot exaggerate our indebtedness to Dr. Julian’s “Dictionary of Hymnology,” a monumental work, without which we could not have reached the high standard of accuracy, as to both texts and authorship, which we set before us when entering upon our labours. AM NOT SURE about the debates going on in Anglo-Saxons liturgical blogs. Being that the United States is where the phrase “liturgical wars” is used, I assume that it’s not all rose e fiori (“roses and flowers”) as we say in Italian, meaning it’s not all pleasant conversation. Italian blogs are the same. When I contribute postings to some of these blogs, some “anonymous” commentators start to insult one another (sometimes even me…) defending or denigrating the liturgical reform. Sometimes I’m surprised to notice that what I say is completely ignored and just used as a pretext to vent their own positions, always making sure to thoroughly offend the interlocutor before proceeding. 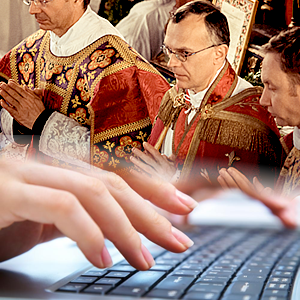 I know that some important people are commenting on the blogs where I contribute: priests, professors, and so on. I’m always amazed to see how being anonymous can make people behave in a way they would never behave if they used their true names. On the other hand, I also know that “liturgical wars” are really wars that have broken the church into two fighting sides. It is difficult to know how we can find a way out from this. I can see that these two factions are condemned to stay together. Probably it would be hard to foresee any form of reconciliation between the two positions in the near future. Maybe there will be a Pope that will take strongly in his hands the “liturgical problem”, as did Saint Pius X, and so a mediation would allow the two fighting sides to understand that we should be one church, not a scattered and always quarreling flock.